RUSH: Scott in Charlotte, North Carolina. CALLER: Mr. Limbaugh, it’s good to talk to you, sir. RUSH: Appreciate that. Thank you. CALLER: As I was telling Mr. Snerdley, because I consider myself, and a lot of people do, part your extended, extended family. CALLER: We hear you talk to Mr. Snerdley and people on the other side of the glass and I hear you talk about your home and, you know, the view you have and I would really love to see a nine-foot television. I’ve never seen one. It’s bigger than my garage door. RUSH: I don’t have one. Fourteen feet. RUSH: Sorry. I don’t have a nine-foot. RUSH: It’s curiosity, you want what you can’t have. RUSH: I mean what you can’t see — no, no, no, don’t mean it that way, you want what you can’t see. You want to see what you can’t see. CALLER: Right. I know a lot of their names, but I don’t know anything about them. RUSH: Well, that’s the way they like it, believe me. They see what happens to me, and they love anonymity. RUSH: And they love the fact nobody knows what they look like. RUSH: Something I can never get back. RUSH: Without plastic surgery, which I’m not going to do. RUSH: As for the behind the scenes stuff, it’s just a matter of — there’s no — I can’t even explain this. I don’t think there is a classy way of doing it. I just don’t. I don’t think that it is — plus, in addition to that, there’s the privacy concerns that I have. RUSH: Of course you do. RUSH: (Laughing.) What was that? I was laughing at myself. CALLER: I said, ever so slightly. CALLER: In other words, just a little peek in the door. RUSH: Okay, well, I may take a picture of my golf clubs. RUSH: That wouldn’t be a big deal. CALLER: That would be a start. RUSH: A picture of EIB 1, a picture of the model. That wouldn’t be a bad thing to do because it’s the exact paint job, a picture of a model of my car, exact paint job. CALLER: I would love to see the car you?ve talked about but you haven’t told us what it was. RUSH: Yes, I have. Are you watching on the Dittocam right now? CALLER: No, no, I don’t have a subscription. I get to listen to you three hours a day and three kids, I don’t have time to watch on television — watch on the computer. RUSH: Yet you would have plenty of time to go to the computer to look at pictures of my TV screen and other things? CALLER: Absolutely, I’d make time. RUSH: (Laughing.) Okay. All right, I appreciate your honesty. Well, thanks. I want to get one more call in here before we have to go. I will, as I do with all these requests, consider it. CALLER: One more thing, real quick, Mr. Limbaugh? CALLER: I hear you talk about ?24? all the time. I haven’t heard anything about the Sopranos in a while, have you lost your taste for them? RUSH: No, it’s just not on the air right now. The only thing I can tell about you about the Sopranos is that James Gandolfini called in sick recently for a shoot they had down in Mulberry street in little Italy in Manhattan. I don’t think this thing is going to start airing ’til March, maybe later than that. It’s not going to start airing ’til Rome ends, and Rome just started. They?re not even finished shooting it, so there’s nothing to talk about. CALLER: Okay. 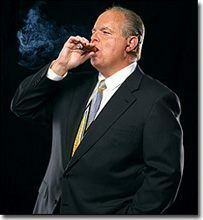 Thank you for your time, Mr. Limbaugh. RUSH: When it premieres and continues its decline, I will comment.